California’s political elites are at odds with history and the natural preferences of millions of Californians. The good life in California is out of reach to ordinary people. The reason for that is simple: homes cost too much, energy costs too much, water costs too much, and transportation infrastructure is inadequate. In each of these critical categories, however, grand bargains are possible that would bring California’s cost of living back down to earth. Unaffordable housing is the most obvious, talked about problem. The solutions being considered in Sacramento are either inadequate or flawed. The most significant proposal currently being considered in the state legislature is SB 50, which would require cities and counties to allow apartment building redevelopment in any place that is either within a half-mile of a rail transit station, within a quarter-mile of a “high-frequency bus stop,” or within a “job-rich” neighborhood. SB 50 would also remove the requirement for developers to provide adequate parking. It is possible that SB 50 will pass. When it does, developers will be able to purchase homes in qualifying residential neighborhoods, demolish them, and construct apartment buildings up to 55 feet in height. There are a lot of things to criticize about SB 50, most notably the fact that it overrides local control of these zoning decisions. More to the point, there is the disruptive impact to residents who invested their lifetime earnings into paying off a mortgage to own a home in a spacious, quiet neighborhood, who will see that ambience destroyed. Not only should these residents be able to rely on the zoning laws that were in place when they purchased their homes, but it is likely they cannot afford to move. If they sell, they will have to pay taxes on any profit over $500K, and once they’ve moved, they will no longer have California’s property tax protections for long-time property owners. Fixed income retirees will be harmed the most by SB 50. Not everything SB 50’s opponents bring up is necessarily valid, however. The accusation that SB 50 will just cause more gentrification is based on cases where new high rise developments were made in the heart of downtown areas, on some of the most expensive real estate on earth. Of course those developments will only attract wealthy buyers. But whenever new housing units are put on the market, basic laws of supply and demand still apply. The wealthy buyers who choose these ultra expensive new units will not be purchasing the alternatives. Whenever more homes are built, then up and down the value chain, from exclusive penthouses to trailer parks, buyers have more choices. The key factor in reducing housing prices in California depends on increasing the supply of homes. SB 50 recognizes this, but only addresses half the problem. SB 50 increases the density of cities, but it doesn’t touch the other fundamental problem, which is the need to expand the footprint of cities. Because of this, it is unbalanced, and as such, it is going to cause far more havoc on existing neighborhoods than would otherwise be necessary. And it won’t fix the problem. No realistic assessment of housing policies, or the history of urbanization, can fail to acknowledge that as populations increase, existing neighborhoods are disrupted. Increasing housing density in the urban core as more people arrive is inevitable. But at the same time, outlying suburbs must be allowed to expand. Here is where the fundamental assumptions of California’s political elites are at odds with history and at odds with the natural preferences of millions of ordinary Californians. By forcing development into urban service boundaries, not only does it become far more difficult to create an adequate supply of new homes, but millions of people who want to raise families in detached single family dwellings with yards are denied that opportunity. 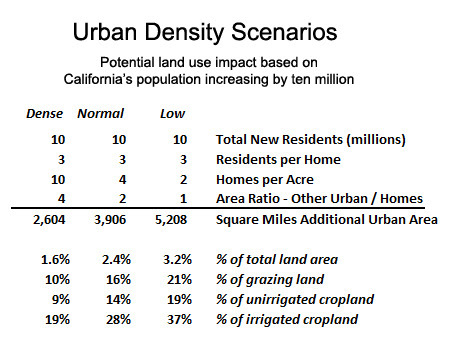 As the chart shows, adding 10 million new residents under the “low” density scenario would only use up 3.2 percent of California’s land. There is no reason why any of this growth has to occur on irrigated cropland. For example, if all the growth were concentrated onto grazing land—much which is being taken out of production anyway, it would only consume 21 percent of it. If all the growth were to fall onto non-irrigated cropland, which is not prime agricultural land, it would only use up 19 percent of that. Much growth, of course, could be in the 58 percent of California not used either for farming or ranching. The grand bargain? Streamline the process for reasonable urban densification but mitigate the impact (and enhance the benefit) by also streamlining the process for urban expansion onto open land. Policymakers might also strike grand bargains in the areas of water, energy and transportation, all critical to making and keeping California affordable as the population grows. In all three areas, not only are policy solutions available, but the array of solutions increases every decade as new technologies become available. The following chart depicts several projects that could be funded through a combination of revenue bonds – to attract private financing, and general obligation bonds – to reduce costs to ratepayers. While these projects are expensive, they are well within the capacity of California’s economy to support, and if constructed, they would guarantee consumers affordable water abundance for several decades, possibly forever. 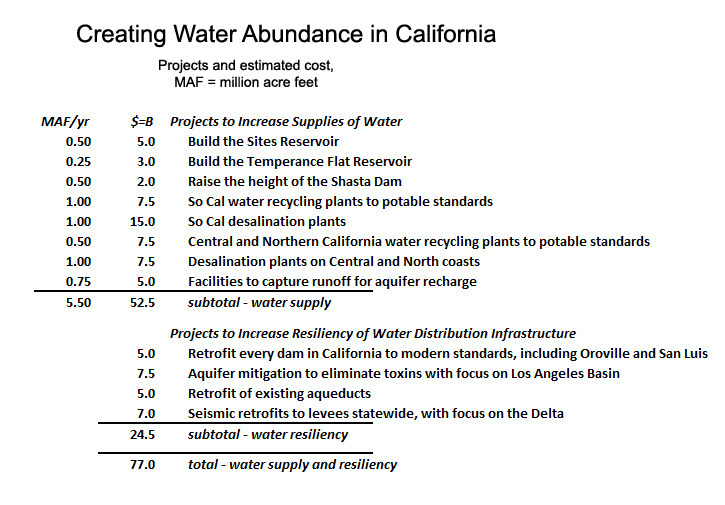 And it is important to note, these are California cost estimates. With appropriate reforms to provide relief from litigation and overregulation, these costs could be dramatically reduced. The capital costs for desalination plants in Israel, for example, per unit of capacity, came in at one-sixth what the costs were for the Carlsbad plant in San Diego. For water, as with everything else that matters, compromise on a grand scale is necessary to negotiate a grand bargain. Environmentalists would have to accept a few more reservoirs and desalination plants in exchange for plentiful water allocations to threatened ecosystems. Farmers would have to pay more for water in exchange for undiminished quantities. While private financing and revenue bonds could cover much of the expense, taxpayers would bear the burden of some new debt – but in exchange for permanent access to affordable, secure, and most abundant water. It is difficult to imagine how any state, or nation, could do worse than California’s done when it comes to providing electricity to its residents. With that ingratiating introduction to the topic, here’s why: Renewable energy has to be priced based on providing a 24 hour, 12 months per year, uninterrupted supply. As it is, renewable energy providers are permitted to sell their electrons based on their direct costs, and utilities are required to purchase it. Meanwhile, when the sun goes down or the wind dies down, utilities have to find power elsewhere. This is extremely expensive, because these backup plants cannot produce continuous power, meaning their construction costs and fixed overhead costs have to be priced into part-time operation. Michael Shellenberger, an energy expert and advocate for nuclear power with impeccable environmentalist credentials, recently published a blistering takedown of renewable energy in Forbes. Entitled “Why Renewables Advocates Protect Fossil Fuel Interests, Not The Climate,” the article provides revealing details about how fossil fuel corporations are pouring money into environmentalist nonprofits that advocate renewables. And why not? By stigmatizing nuclear power into oblivion, the only reliable way to balance intermittent flows of renewable energy is to build more natural gas fueled power plants. The solution to providing California with abundant energy is to retrofit, expand and recommission existing nuclear power complexes and build new ones, along with building more natural gas power plants. The grand bargain? Environmentalists get cleaner air, but have to accept nuclear power. Special interests that advocate renewables can still sell their products, but have to price in the costs for them to cover their nightly and seasonal production deficits. Fossil fuel interests can continue to operate, but have to compete with nuclear power. And California’s power consumers will see prices in a competitive market come back down to national standards. California’s roads are poorly maintained and inadequate. Meanwhile, the most egregious waste of public funds perhaps in history, the “bullet train,” continues to hang on to life as a truncated boondoggle still planned to connect Merced to Bakersfield. Explaining the folly of high speed rail in California may also explain the benefits of alternative solutions. Within a few decades, self-driving cars, some owned for personal use, others privately owned but serving the public, will zoom along smart hyperlanes at speeds well in excess of 100 miles per hour. They will convoy with each other, running close together, using linked navigation systems, to facilitate far more throughput per lane mile than today’s freeways. Overhead, within a few decades, electric drones will shuttle people to and from their chosen destinations at speeds well in excess of 200 miles per hour. And far overhead, at around 50,000 feet, supersonic planes , electric VTOL/turbojet hybrids, will fly at speeds well in excess of 1,000 miles per hour. This is the future of transportation in California, a future that demands upgraded roads and new modes of FAA administered airspace. As for rail, upgrading existing rail might have tremendous practical value. But why take a bullet train, when within a decade or two you’ll be able to dial up an aerial Uber on your cell phone, and at speeds exceeding the most optimistic HSR projections, fly from any rooftop in San Francisco to any rooftop in Los Angeles? The good life can be recaptured for all Californians. The weather’s still great. The land is still beautiful and bountiful. The economy remains diverse and resilient. But California’s current policies have stifled innovation and created artificial scarcity of literally every primary necessity – not just housing, but water, energy and transportation. Each year, to comply with legislative mandates, government agencies and private developers alike spend billions of dollars to pay attorneys, consultants and bureaucrats, instead of paying engineers and heavy equipment operators to actually build things. The innovation that persists despite California’s unwelcoming policy environment is inspiring. California’s policymakers have adhered relentlessly to a philosophy of limits. Less water consumption. Less energy use. Urban containment. Densification. Fewer cars and more mass transit. But it isn’t working. It isn’t working because California has the highest cost of living in the nation. Using less water and energy never rewards consumers, because the water and energy never were the primary cost within their utility bills – the cost of the infrastructure and overhead is always the primary cost. And nearly all these policies – high speed rail is the perfect example – diminish if not ignore potential technology breakthroughs on the horizon. Within the next few decades, there will be modular, plug-and-play desalination units that coastal municipalities can put offshore to supply abundant water to consumers. In turn, these desalination units can be powered by modular, safe, plug-and-play nuclear reactors, scaled to whatever size is required, and nearly maintenance free. It doesn’t end there. Within the next fifty years or so, energy will be beamed from orbiting solar power stations to earth-based receivers to deliver uninterrupted electricity. We’re also probably less than fifty years from having commercial, scalable fusion power. A completely new mentality is required, incorporating a vision of abundance instead of scarcity that encompasses every vital area of resource consumption. A completely different approach that could cost less than what it might cost to fully implement scarcity mandates. An approach that would improve the quality of life for all Californians. Without abandoning but merely scaling back the ambition of new conservation and efficiency mandates, embrace supply oriented solutions as well. These are the grand bargains that would make California affordable again. Edward Ring is a co-founder of the California Policy Center and served as its first president. This article originally appeared on the website California Globe.